The Bell 206L LongRanger is a 7-seat light utility helicopter powered by a single Rolls Royce Allison 250-C20B turbine engine. In 1961, Bell developed Model 206 as the OH-4A to meet the U.S.Army requirements. The OH-4A flew first on 8 December 1962. However the Bell OH-4A didn't win the competition, the helicopter was a success as the Bell 206 JetRanger. The prototype of this five-seat commercial model, the Bell 206A JetRanger N8590F, flew on 10 January 1966. Bell received FAA certification for the helicopter on 20 October 1966, and deliveries of the Model 206A powered by a 317 shp Allison C18A engine, started in January 1967. In the early 1970s, production switched to the Model 206B JetRanger II with a 400 shp 250-C20 turboshaft. In September 1973, the development of the LongRanger, a stretched JetRanger was announced. The 206L LongRanger flew first on 11 September 1974 and production started early 1975. More than 4800 206Bs and 1700 206Ls have been produced since the introduction of the 206A JetRanger on 13 January 1967, when the first two production aircraft were delivered to customers. Since then, Bell has delivered five different generations of the commercial 206 with its 206A/B JetRangers and 206L/L1/L3/L4 LongRangers. Bell 206 aircraft are currently produced at Bell Helicopter's facility in Mirabel, Canada. Production of the Bell 206B3 JetRanger ended in 2011. The Bell 206L4 LongRanger IV will remain in production. The ICAO Aircraft Type Designator for the Bell 206L helicopters is B06. The 1977-built Bell 206L LongRanger s/n 45103 was flown first on 31 May 1977 and operated as N16773 by Crescent Airways in Pembroke, Florida, USA. Swedish Rentaco AB purchased the helicopter in mid-1987 and the registration N45103 was cancelled on 5 May 1987. On 17 July 1987, the LongRanger was registered in Sweden as SE-HSA and entered service with Helicopter Assistance AB. The company operated it three years before it was sold to Helicopter Arrangemang Bell HB. In March 1994, the helicopter was exported to Heli-Holland Holding BV. 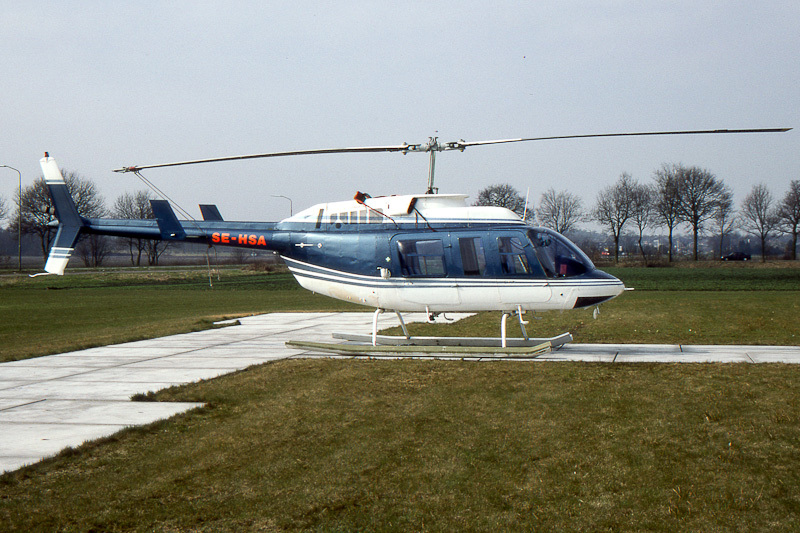 On 29 March 1994, the LongRanger arrived as SE-HSA at the Heli-Holland heliport near Emmen in the Netherlands. After the registration PH-HXH was reserved for this Bell Helicopter Textron 206L Long Ranger on 12 January 1994, it was registered as PH-HXH with Heli-Holland Holding BV, Emmer-Compascuum, on 14 April 1994. LongRanger PH-HXH was operated by Heli-Holland until April 2007. On 4 May 2007, registration PH-HXH was cancelled as exported to Canada. The same day, the LongRanger was registered C-GMQH with Quantum Helicopters Ltd., Terrace, British Colombia. On 16 May 2011, registration C-GMQH was cancelled after the CofA expired. On 13 June 2011, the C-GMQH was restored to the the register with Quantum Helicopters.